It all started around 3PM on Thursday when a dad was hanging at home with his 3 week old baby. This dad’s older son left some Cheerios on the couch, so dad did the logical thing. He put a Cheerio on his baby boy’s nose. Then he added a second Cheerio, followed by a third. Soon he had stacked five Cheerios, and he snapped a picture. Now, it may have ended here for most dads. However, Patrick Quinn is one of the co-founders of Life of Dad, a vibrant community for fathers online. Quinn posted the photo to Life of Dad’s Facebook page, which reaches 10-15 million people weekly, and the rest is internet history. The photo started garnering some attention quickly, and David Guest, another Life of Dad co-founder, suggested we put some Facebook advertising dollars behind it. We did, but before that ad was even approved, the challenge had already reached over a million people. People were leaving comments with their own photos, and Quinn shared a few of those on Facebook. Let me introduce myself now. I’m Tommy, the original founder of Life of Dad, and I knew that what Quinn had started was something that we had been waiting years for. We had gone viral before with Dads Singing The Little Mermaid, and a Single Dad’s Emotional Letter, but I thought this had the chance of being something special, based on the immediate positive response. I knew we needed a hashtag to allow this challenge to take off on Instagram and Twitter. I encouraged Quinn and Guest to use #CheerioChallenge in every comment and related post from here on out. I started sharing all of the photos (including Quinn’s original) on Twitter and Instagram with #CheerioChallenge. We were putting out one photo each half hour. After having drinks with a friend (while tracking the momentum the entire time), I went home, cracked a nightcap beer, and scheduled Facebook, Twitter, and Instagram posts for every half hour throughout the night. If we wanted this to really take off, we needed to capitalize now. We couldn’t allow it to slow down overnight. The next morning, it had taken off. A few Australian publications wrote about #CheerioChallenge, and we were on our way. I encouraged Life of Dad’s different Facebook, Twitter, and Instagram teams to focus on this all day long. Each social network is so different, that you really need somebody in the trenches commenting, replying to messages, and engaging with people, if you want to find success. We used the #CheerioChallenge hashtag everywhere and often. Buzzfeed wrote a column late Friday morning, which really opened up the flood gates. By mid-day Friday, Cheerios was joining the party. They were tweeting and commenting with hashtag users. We got a call from them soon thereafter, wanting to begin a formal partnership. By Friday evening, #CheerioChallenge was trending on Facebook and Twitter, and we had lost control of Patrick Quinn’s little idea. People from all around the globe were participating. In excellent timing, Sunday was Father’s Day, so many publications and TV shows picked it up as a top story. The viral effort has garnered hundreds of millions of impressions and media mentions on Today Show, Good Morning America, CNN, USA Today, Buzzfeed, Mashable, and many more. The original #CheerioChallenge post has over 10,000 comments and 30,000 shares. 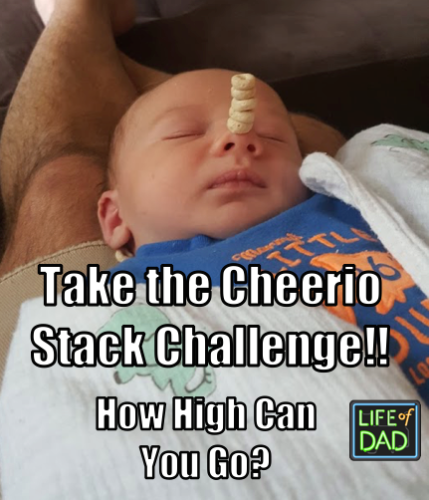 As a company which makes influencer marketing activations come to life on a daily basis, #CheerioChallenge is the best case study that Life of Dad could ever ask for. This has become our single biggest result to date and has outpaced all other efforts. We’re are excited about what is next for our influencer network and bringing what we have learned from the #CheerioChallenge to other clients. Join other brands and agencies who have utilized the creative influencers of the Life of Dad Network. Acting as both the largest dad influencer (Life of Dad) along with our network of digital dads (over 200 different influencers who have joined in our campaigns), we are the worldwide leaders in effectively marketing to dads. Even before #CheerioChallenge, we had reached over 100 million the week of Father’s Day with our influencer marketing activations. We want to work with you to put together a comprehensive influencer marketing campaign to raise your client’s visibility among this target market. Life of Dad serves the dad market like no one else. Through our targeted, dad-centric influencer marketing capabilities and exclusive social network platform, Life of Dad is the destination for the modern, connected dad.